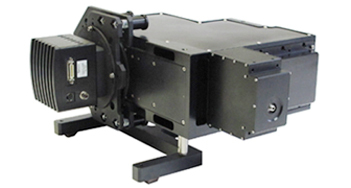 The EMU-120/65 is designed for F/3 or faster input optics, giving it the highest etendue (numerical aperture x slit area) of any broadband echelle spectrograph. The throughput of the EMU-120/65 is typically 10x to 20x higher than other broadband echelle instruments. With its high etendue, the EMU-120/65 is the first echelle spectrograph that is versatile enough for both LIBS (laser-induced breakdown spectroscopy) and Raman applications. The EMU-120/65 is designed for use with gateable EMCCD cameras and it covers the entire range of the detector (UV-VIS-NIR) in linearized units of wavelength or Raman shift in one exposure. User-changeable dispersion cassettes and entrance slits are adaptable to the application's needs for throughput and resolution. 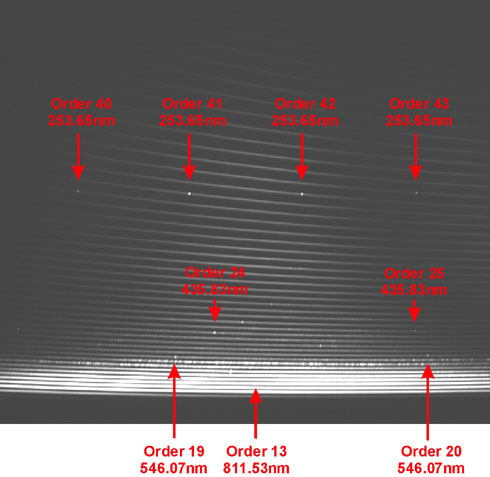 Each EMU-120/65 image contains spectral data across a wide wavelength range in multiple orders because of the cross-dispersing prism in the spectrograph. Each image takes full advantage of the wavelength coverage of the detector. Our KestrelSpecTM Imaging Spectroscopy software uses Catalina Scientific's unique "3-point" KestrelCal calibration procedure to create a complete, linearized spectrum from each EMU-120/65 image. The software can calibrate spectral curves in either wavelength or Raman cm-1 units. Catalina Scientific has compared the F/3 performance of the EMU-65 with the F/10 performance of the SE 200 echelle spectrograph. The two echelles were compared using the same EMCCD camera on both instruments. The two spectrographs were then compared with the EMCCD on the EMU-65 and an ICCD on the SE 200.